Toys"R"Us has announced the release of its 20th Anniversary edition of the ToysRUs Toy Guide for Differently-Abled Kids, an easy-to-use toy selection resource for those who know, love and shop for children with special needs. Now in its second decade of annual publication, the complimentary shopping guide is a go-to for families, friends and caregivers involved in the special needs community, and is available in Toys"R"Us and Babies"R"Us stores nationwide, as well as online at Toysrus.com/DifferentlyAbled in both English and Spanish. 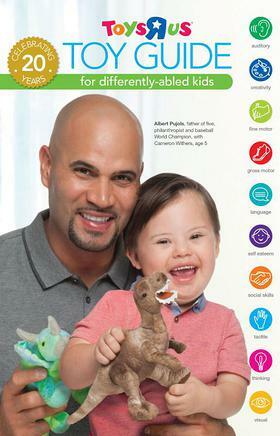 This year, Toys"R"Us is teaming up with baseball World Champion, proud father and special needs advocate, Albert Pujols, who appears on the cover alongside Cameron Withers, a 5-year-old boy from Southern California. While Pujols is known for his passion on the diamond, his dedication to the special needs community is even greater. As a parent to a daughter with Down syndrome, Pujols serves as a vocal advocate for children with special needs through the Pujols Family Foundation. Since 2005, the Pujols Family Foundation has worked diligently to provide children and families living with Down syndrome with the tools they need to thrive. As part of the launch of this year’s Guide, Pujols will bring that same devotion to his partnership with Toys"R"Us in helping to reach its customers nationwide and raise awareness of this one-of-a-kind resource. “As a proud dad to my beautiful daughter, Bella, who lives with Down syndrome, I understand how important it is to have resources like the Toys”R"Us Toy Guide for Differently-Abled Kids to help in making informed choices to support a child’s development. 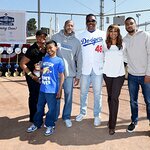 And, as a professional athlete, I truly value the importance of play and recognize the impact it has in the lives of children who face everyday challenges – for these kids, playtime is not just about fun, it’s an opportunity to explore their strengths and experience success in reaching each new milestone," said nine-time All-Star baseball player, Albert Pujols. “I have a tremendous amount of passion for this cause, and I’m excited to partner with Toys”R"Us to make it easier for gift-givers to find toys for the special needs children in their lives that will inspire their imagination, encourage inclusive play and help them develop new skills." Serving as a trusted resource for family, friends and caregivers of children with special needs, the Guide is packed with everyday playthings selected for their unique ability to help kids build critical skills, such as creativity, fine and gross motor and self-esteem, during playtime. Each of the toys featured in the 63-page buying guide has been vetted in partnership with the National Lekotek Center, a nonprofit organization dedicated to making play accessible for children of all abilities. “For two decades, the Toys”R"Us Toy Guide for Differently-Abled Kids has been a valuable resource for parents looking to find toys that help build specific skills for their children," said Kathleen Waugh, Chairman, Toys"R"Us Children’s Fund. “We’re honored to partner with Albert Pujols in our goal to bring joy to children of all abilities. Toys”R"Us has a long-standing commitment to ensuring tools like the Guide are accessible and available for parents and children everywhere." Through the Toys"R"Us Children’s Fund, Toys"R"Us, Inc. has long supported the special needs community via organizations such as: American Society for Deaf Children, Autism Speaks, the Pujols Family Foundation, HollyRod Foundation, Muscular Dystrophy Association, National Down Syndrome Society, National Lekotek Center, National Organization of Parents of Blind Children, National Center for Learning Disabilities, Special Olympics, Spina Bifida Association and United Cerebral Palsy. For more information, please visit www.toysrusinc.com/charitable-giving/.